I was working from home yesterday when Henry came in with a classic six year old "Whacha Doing?? What are WE doing? What CAN we do?? I AM BORED!' type conversation. I felt an overwhelming sense of doom in regards to my work day, so I hastily asked if he wanted to see if Luke wanted to come over. I didn't put much thought into it, just decided to throw the idea of his best friend out there and see if it worked as a way to buy me some quality working time and him some in home entertainment. He also asked if he could ride his bike over to Luke's house to pick him up. They live extremely close, so I said sure. He rode his bike and I walked along behind him, pushing him up any hills that were too daunting. As we got to Luke's house he was there on his bike ready to ride back with us, and it hit me how he is growing up. How this week I am following him as he rides his bike to his friends house, but that it will feel like not time at all to when he makes this trip on his own. That we are slowly but surely setting him up to be more independent, more grown up, more his own person. And it's great. I am so happy he has such amazing friends. I am so happy we live in a neighborhood where he can ride his bike to his best friends house. But it's also another sign of how fast time is moving. 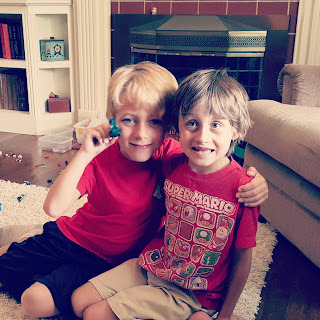 As we got back to the house I worried the boys would be a bigger distraction from my work day than just having Henry at home, but turns out they were perfectly entertained with each other all afternoon. They really only needed me there to provide food. Also, to join in a short dance party. One of those two things I think will continue on well into their high school years. The other I highly doubt will last beyond early elementary school. Anyway, I don't have anywhere I am going with this. Just, yet again, a post about time. About how fast Henry is growing up, and how I am so happy with the kid he is becoming. I love his humor, his heart, his friends. Man, I love his dance moves. Each day I love him a little more, and each day I want time to slow down so I can hold on to him for just a little bit longer. He absolutely cracked me up at the Minions movie today. He thought everything was so freaking hilarious, that I enjoyed him more than the movie.